The Monster X should be the standard weapon for every commander or heavy gunning fighter. It has enough power to keep up with any other powerful CPS weapon, and is large enough to psychologically intimidate your opponents. 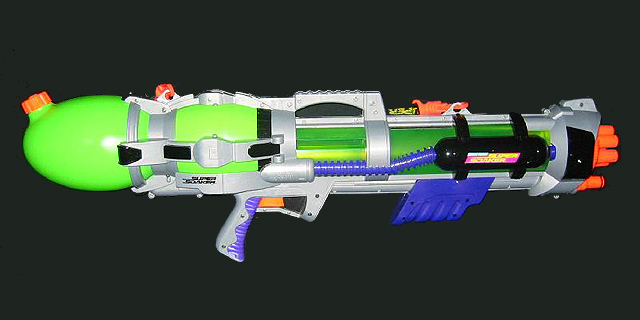 The very cool looking design and color scheme is something that is an improvement over the classical big CPS soakers. It is also not as heavy as the Monster XL. In a matter of fact, if you hang the MX on your shoulder with the strap, you can comfortably shoot from your hip without any heavy lifting. The long shoot time on the 5X nozzle gives you an edge over most CPS soakers. Changeable nozzles give you a choice in how you want to conserve water and the Super Charger ability is helpful if you need to refill quickly. Some drawbacks include the length, and weight if your fighting style includes running around. Also the tank, even though it's large, can be emptied fast. But that's true for every CPS soaker. The MX strength is well build and requires few pumps. It is very robust, and you don't have to worry about breaking anything while pumping. It takes about as many pumps as the CPS 2100, but the pumping is easier. As a side arm I would recommend a Max-D 6000, a CPS 2100 or a CPS 4100. On the other hand, a second Monster X hanging on your other shoulder is not such a bad idea if you're a heavy gunner or if you don't like people ganging up on you. I recommend getting a Monster X, since it is a very good defensive and offensive weapon. 2 2002 Rerelease Equal Shorter; orange front.